National Oceanic and Atmospheric Administration (NOAA) meteorologists began production of satellite-derived maps of Northern Hemisphere snow cover extent (SCE) in late 1966. Map data have been used in international assessments of climate variability and change, and in investigations regarding the role of snow cover in the climate system. Despite their proven climate utility, meteorological forecasting has been the driving force behind producing these maps. As such, changes (documented and undocumented) in mapping methodologies have occurred over time, without a focus on their climatological continuity. Members of our team have kept a watchful eye on changes in this satellite environmental data record (EDR). From this EDR, we have developed a satellite SCE climate data record (CDR). Hand-drawn snow mapping commenced in late 1966. Robinson completed a reanalysis of the 1966-71 period in 2000, representing a first step in converting this EDR to a CDR. Some maps in the 1970s and early 1980s had areas mapped as "patchy" and subsequently digitized as snow covered. An investigation showed them to be areas with less than 50% snow cover, thus they were removed from the digital archive. Driven by needs of the weather forecasting community, an upgrade of the temporal and spatial resolution of the NOAA snow map product took place in the late 1990s. Following a two-year test overlap period, the coarse weekly product was officially replaced with a daily Interactive Multisensor Snow and Ice Mapping System (IMS) 24 km resolution product. Comparing the 1966-99 climatology and 1999-08 IMS climatology found mismatched cells in each month. So too were mismatched cells found during a weekly and proto-IMS dual mapping period from 1997-99. Where mismatched cells were found for both tests, they were removed or added from weekly maps from the 1966-99 era, to better agree with IMS era mapping. The resultant "fine tuning" of SCE primarily addresses the IMS conversion to weekly and inconsistencies in mountainous regions (such as the Himalayas) during specific months of the year. 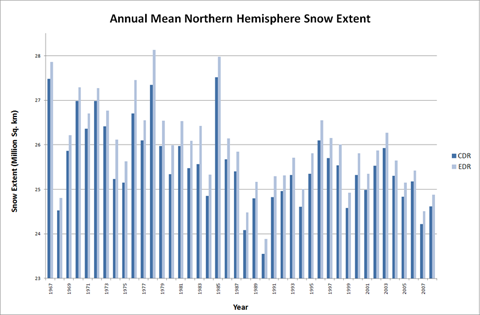 The Climate Data Record (CDR) of Northern Hemisphere (NH) Snow Cover Extent (SCE) is operational at the National Centers for Environmental Information (NCEI). Click here for more information, or to download the product in netCDF format. Data merging the NOAA/NCEI NH SCE CDR with MODIS and microwave satellite-observed estimates of snow extent over Northern Hemisphere lands, as well as with CDRs developed for snow melt atop Arctic sea ice and the Greenland ice sheet are now available. Products have been published at the National Snow and Ice Data Center (NSIDC) as part of NASA’s Making Earth System Data Records for Use in Research Environments (MEaSUREs) program. Click here for more information, or to access merged cryospheric products.